Add comfort and style to your home without spending thousands of dollars on a top-to-bottom remodel. Simply turn to our flooring store where you'll find the largest selection of brand-name carpet. Shop our vast selection of quality styles, types, and brands to find carpet that matches your home's style, design, and interior decor. Our carpet store does much more than sell carpeting. We go the extra mile to provide you with a level of service you've never experienced before. Stop by our convenient location, and you will see why homeowners return to us again and again for their carpet needs. There are many companies in the area offering carpet, but all pale in comparison to our carpet store. We employ a highly trained sales team that is dedicated to one thing: providing you with a pleasant experience from beginning to end. Schedule your free consultation and in-home evaluation with our professionals. Using our unrivaled industry knowledge, we will provide you with answers to your questions, assess your needs, and help you find the ideal option from our extensive carpeting selection. Don't just take our word for it. Instead, visit our convenient location and talk to our sales associates. You will soon see why we're the premier carpet store in the area. There are seemingly endless types of floor coverings available on the market, including carpet, hardwood, tile, laminate, and more. What makes carpeting so special? First and foremost, carpet is one of the most affordable types of flooring. In fact, the materials, labor, and carpet cost only about $3.75 per square foot on average. Although, hardwood and natural stone tile are beautiful, they cost more than carpeting, depending on the type. The cost savings aren't the only reasons many area homeowners choose carpeting as their flooring choice. There are numerous benefits of carpet that other coverings cannot provide. The floors in your home are going to be one of your biggest investments, aside from your home itself. Increase your home's value, or revitalize a room. Whatever your reason for installing carpet, our store is ready to assist you throughout every stage of the selection process. Nylon - Though more expensive than other synthetic fibers, nylon is well worth the price. It is more versatile, stain resistant, and abrasion resistant than any other fiber available. Wool - Wool Berber not only feels great underfoot, but it is a great value for your dollar. As well, because it is woven from sheep’s wool, it is an environmentally friendly option. 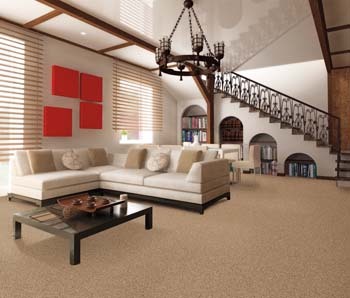 Olefin (Polyester) - Polyester Berber carpet gives you the same high-end, durable carpet for less. Triexta (PTT) - This is a chemical compound fiber that performs just like nylon. As an added bonus, it is actually softer than nylon fiber. You've found the perfect brand, style, and color. All that is left is your carpet installation. Unfortunately, this is easier said than done. Instead of spending endless hours researching local carpet installation contractors in the area, put your trust in our professionals. Backed by many decades of experience, we can complete carpet installation jobs of all sizes, regardless of the extent of the work. In short, our carpet store is your go-to source for all your carpeting needs..We go a step further by providing you with our Ultimate Confidence Guarantee. If you're not satisfied with our work or product, we will change it to ensure your satisfaction. When you're looking for carpet, contact our flooring specialists. We are committed to satisfying your unique needs, and we are proud to serve the communities of Belmont, Laconia, Gilmanton, Wolfeboro, and Moultonborough, New Hampshire, and the surrounding areas.